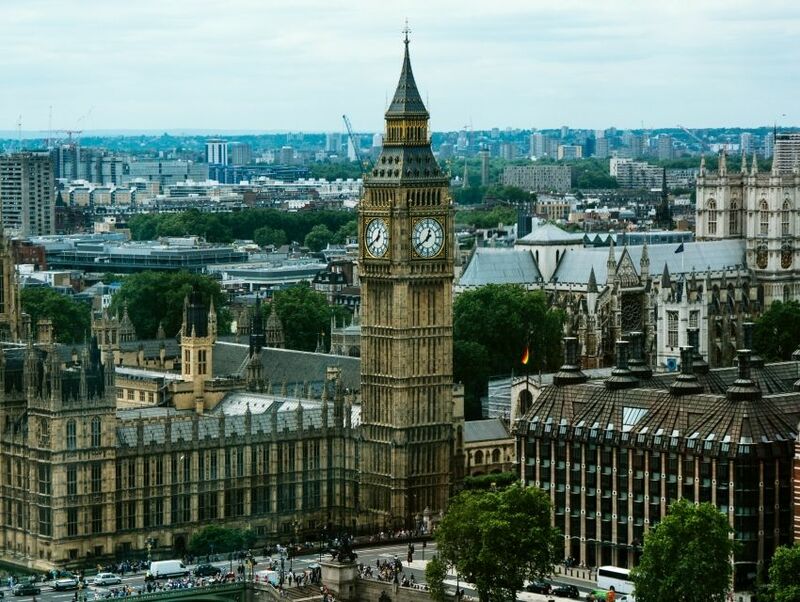 "The Most Famous Clock in the World"
Referring both to the famous tower that forms the north end of the Palace of Westminster, as well as the iconic clock built into its face, the Big Ben is deemed as one of the most prolific timekeeping devices of the 19th Century. This hugely exalted monument was constructed when the old Palace of Westminster was ravaged by a fire in 1834, sparking the need for a newer structure. It was then that English architect Augustus Pugin's spectacular design for the tower found fruition, an imposing Gothic Revival structure that would go on to become one of the most striking icons of the British empire. Towering over 315 feet (96 meters), the Big Ben is a brilliant blend of sand-colored Anston limestone that dominates its lower half, and a cast iron spire that pierces the city's ashen skies. Its impressive timekeeping mechanism weighs in at over 5 tons, and the pendulum, which beats once every two seconds, weighs 203 kilograms (447.53 pounds). While this imposing structure can be admired from a distance by overseas visitors, only residents are privy to the internal depths of the tower.